Simplicity and ease of use are key for InstaPage. From the setup, it’s clear that they’ve focused their design for professionals and small businesses just beginning their foray into the world of marketing. 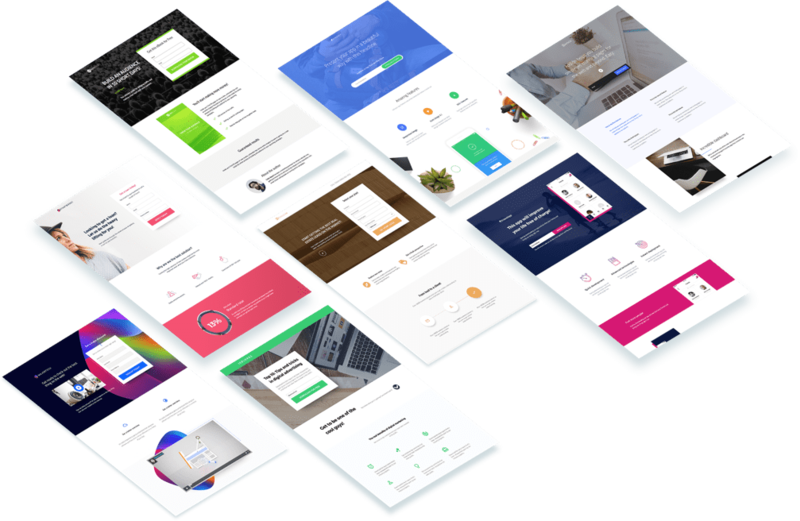 Creating quality landing pages is fast and easy with the simple, uncluttered interface – though the caveat is that more advanced marketers may be frustrated with the lower variety of features and slightly diminished functionality. Analytics-wise, InstaPage is also more simplified compared to its competitors – though users can rest assured that the most important data is still available. Instapage focuses its attention on small businesses and individuals who are only just setting out into the marketplace, with the aim to help them understand how easily they can build quality landing pages. Whether you want to optimize your page for search engines, test pages using A/B split testing tools or capture user data through opt-in forms, Instapage has it all! Want to know if InstaPage is right for you? With Instapage, you can create a landing page from a template very easily. Selection: There are over 200 templates to choose from, all featuring very strong CTAs, conveniently arranged by the use case scenario: Lead generation webinar invitation, events, ebook promotion and more. Customization: You can start with a blank template, or tweak these existing designs, as well as use their stock images or uploading your own. Whether you want to integrate social widgets, benefit from SEO tools for marketing in search engines, or using a drag-and-drop tool to be able to fully customize your landing page, Instapage can provide for your needs with ease. It also includes some unique features, like a collaborative workspace that allows multiple team members to review, edit and comment on landing pages and campaigns before they get published. Instapage has an endless amount of available integrations, ranging from advertising tools to analytics and CRM’s, Email marketing tools, live chat, webinars- you name it! It’s great to have all the tools and features you can get your hands on, but its no good if you can’t use them. With InstaPage you don’t have to worry about something not being crystal clear because they focus towards the lesser skilled users. 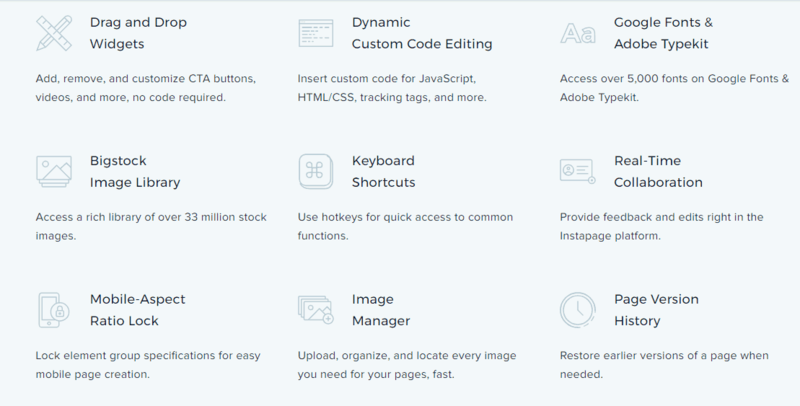 Everything from the editor through to the functionality of the features is simple to use, meaning you spend less time reading and working things out, and more time building a fascinating and professional looking landing page with high conversion rates. It’s not meant to be the most powerful builder app on the market, just the easiest, and they do a pretty good job of it. Instapage has a robust Support Center with loads of videos. There’s also a decent knowledge base and you can contact support via email, but there is no user forum. The active blog will load you up on tips & tricks. When you sign up, they offer you a 15-minute live demo as well as a callback if you have any questions about features or service. Instapage Pricing ranges from around $65 to over $200 monthly. While this may seem pricy, remember we are not just talking about a landing page generator, but a full suite of features and marketing tools that will help convert your visitors into paying customers or subscribers. Paying for an annual plan would be a wise choice, as it entitles you for a considerable discount. While they don’t offer a free plan, they do have a 14 day free trial with no credit card required, which will help you get to know the tools and interface before you commit for a long term subscription. InstaPage introduces webmasters to the concept of landing pages and marketing. They take the guesswork out of A/B testing with an automatic optimization feature that tests variants in the background and integrates the best results.